Romo plays as an amateur, so his $125,000 first-place check will go to charity. 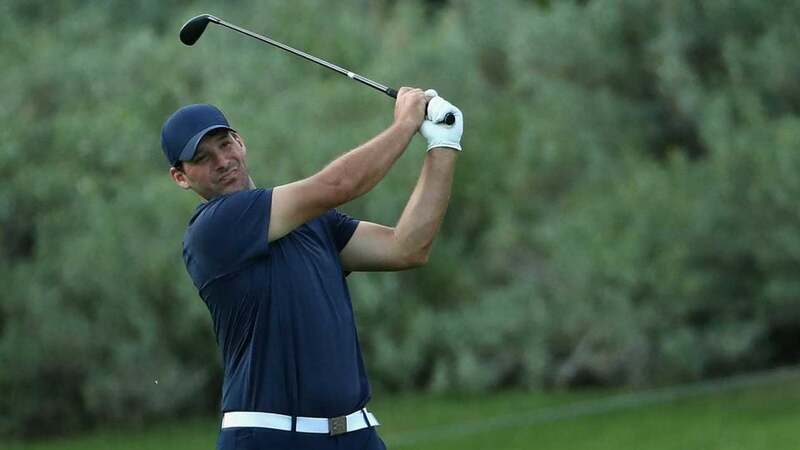 SOUTH LAKE TAHOE, Nev. (AP) — Former Dallas Cowboys quarterback Tony Romo rallied from four points back to win his first American Century Championship at Lake Tahoe on Sunday. Romo, who retired after the 2016 NFL season and is now an NFL analyst, had 27 points on the day to beat three-time defending champion Mark Mulder and San Jose Sharks captain Joe Pavelski, the the leader after the first two rounds. "It's a special win," said Romo, who had finished second three times in seven previous trips to the annual celebrity golf tournament at Edgewood Tahoe Golf Course. "It feels like you're playing a tournament back home here. The day felt good for a lot of reasons." Romo tapped in for par, worth one point, on the 18th hole to finish with 71 points, three ahead of Mulder, the former major league pitcher. He then caught a flight to Berlin, Wis., where he was to compete in a 36-hole U.S. Amateur qualifying tournament on Monday. The American Century Championship uses a modified Stableford scoring system which rewards points for eagles (six), birdies (three) and pars (one) and deducts points (two) for double bogeys or worse. Bogeys are worth zero points. Pavelski had a 7-foot eagle putt on the par-5 18th that could have tied Romo, but it slid by. He finished with 66 points, tied for third with Ray Allen, who will be inducted into the Naismith Memorial Basketball Hall of Fame on Sept. 7. "It feels like nothing went in for me today," Pavelski said. "But I couldn't ask for more than to have that putt to tie on the last hole." Romo plays as an amateur, so his $125,000 first-place check from the $600,000 purse will go to local charities and the Stowers Institute for Medical Research, the primary charitable arm of title sponsor American Century Investments. Rounding out the top five were Trent Dilfer, a Super Bowl-winning quarterback with the Baltimore Ravens in 2001, and former tennis player Mardy Fish. Each had 62 points. Golden State Warriors guard Steph Curry, who fell out of contention with a mediocre round Saturday, jumped into Lake Tahoe amidst much fanfare after losing a bet to his father, Dell. The elder Curry jumped into the lake last year, so he negotiated a 20-point handicap and won by two points. Other notable players in the 92-player field included John Smoltz, the MLB hall of Fame pitcher who two weeks ago competed in the U.S. Senior Open and finished 10th here with 53 points; Steph Curry, who finished tied for 11th with retired Marine and wounded war hero Andrew Bachelder (50); actor Jack Wagner (16th, 47 points); Green Bay Packers quarterback Aaron Rodgers (tied for 18th, 44 points); actor Ray Romano (tied for 71st, minus-26 points); comedian Larry the Cable Guy (tied for 77th, minus-33 points); and former NBA great Charles Barkley, who finished alone in last with minus-93 points. The tournament drew 57,097 fans for the week, setting an attendance record for the fourth straight year.